Indeed, the gizmo above is meant to be used as a gas pedal. 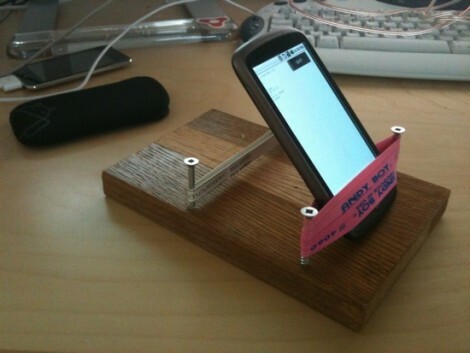 [Grant Skinner] came up with the idea to control slot cars using an Android phone as a gas pedal. He coded the software for the handset and a computer using Adobe AIR. Once connected, the computer is sent the accelerometer data from the phone, relaying the speed control to the slot car track with the aid of a Phidgets motor controller. See it ‘go’ after the break. We’ve seen the Phidgets board used in several projects like the augmented vending machine and the plotter white board. What we haven’t seen is hacks that make use of AIR, a framework we looked at two years ago. If you’ve got hacks that make use of AIR we want to hear about them. @alex: There was a problem with my link. Thanks for pointing it out, it is fixed now. a bit overkill, but its a nice bit of coding work. I would have just used a hall effect sensor. I build electric scooters with them all the time, they work really well. but is it not more likely to use the hall sensors in the device for such a application, to get the tilt information of the phone as an absolute data? Maybe I’m completely wrong but the acceleration data as some kind of relative data would only tell me whether the phone is just moving or not. If I carefully release the phone (with very little acceleration), I could go back to the initial state without change anything…. With the acceleration sensor you get a vector facing down, so if the phone is not in motion, you know the attitude of the phone. But moving the phone upside down downwards with 2g would produce the same sensor output as lying it on an even ground -> 1g. the accelerometer measures strain (deflection) of a very small cantilever that is affected by gravity. The sensor reports X,Y or X,Y,Z orientation by using gravity, so it isn’t the same as the ones we made in physics class with a rubber band to ride on the roller coaster. Wow, it’s so simple but looks like fun. I’ll have to give it a try. I might even throw in a useless steering wheel, just to add to the experience.